Morel mushrooms are a very popular delicacy in the gourmet world. What are these earthy treats and how can you use them? Read on to find out more about why people spend their entire lives hunting morels. Morels are a type of edible mushroom closely related to many of the other mushrooms that you eat everyday. These particular mushrooms have a honeycomb cap that is filled with a network of ridges and pits that look a lot like netting. Morels grow in many areas, though they are particularly popular in French cuisine. Morels tend to be very expensive when purchased in markets, but there is a whole culture of people who spend their time gathering their own wild mushrooms for both fun and profit. Morel mushrooms have been called by many names in the past. These include the dryland fish, hickory chickens, miracle mushrooms and spongy mushrooms. They come in a series of colors, from gray, yellow, brown, black and reddish orange depending on the species and age of the particular colony they came from. 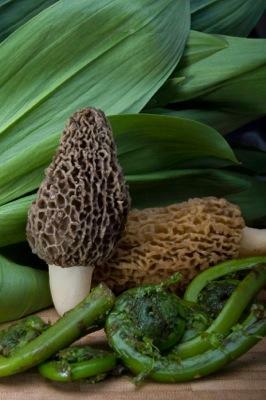 While there are several different kinds of morels, perhaps the most important thing is to understand what is not a morel. There is such a mushroom called the false morel, which, while it looks like a morel mushroom, is actually deadly. Morels can be found under many different kinds of trees, including ash, sycamore, cottonwoods, apple trees, oak trees, poplar trees, and dead elm trees. Morels tend to grow in a place where there was a recent forest fire, and for two or three years after a fire has occurred, colonies of morels may appear regularly in the same places, under the same dead trees. morel mushrooms are a delicacy in many different cuisines, but especially in French cooking where morels are considered highly prized and tend to be very expensive. Once they have been brushed to remove dirt particles from the crevices in the caps, morels can be easily dried and stored for later use, but like most cooking ingredients, morels are tastier and have a better texture when they are served freshly after gathering. Why do people love morels so much? Perhaps it's their rich, earthy flavor, or their firm, meaty texture. Morels can be served in many ways. They can be added to sauces and stews, served with meat dishes, or eaten simply. They can be enjoyed in large, elaborate dishes, or sautéed up with a little bit of butter, salt and pepper and enjoyed as a nice site to a hearty entrée. A word of caution: while morels are safe to eat, they do contain a tiny bit of toxin that is usually neutralized by cooking. This is why professional mycologists generally do not recommend eating raw morel mushrooms. They can cause digestive distress, among other symptoms. Also, it is recommended that you do not eat morel mushrooms with alcohol, which may exacerbate symptoms of toxin exposure. Mushroom hunting is an activity that you should only take part in if you are properly trained by a professional mycologist. There are many schools and organizations out there that will train you on the finer points of mushroom hunting. This is not something you should take lightly! Foraging for mushrooms is serious business. If you mistake a poisonous mushroom for an edible one, the consequences can be dire.